It's Saturday and time for another colour duo from Dynamic Duos! The colours are bold and sassy this week and this due is perfect for summertime. 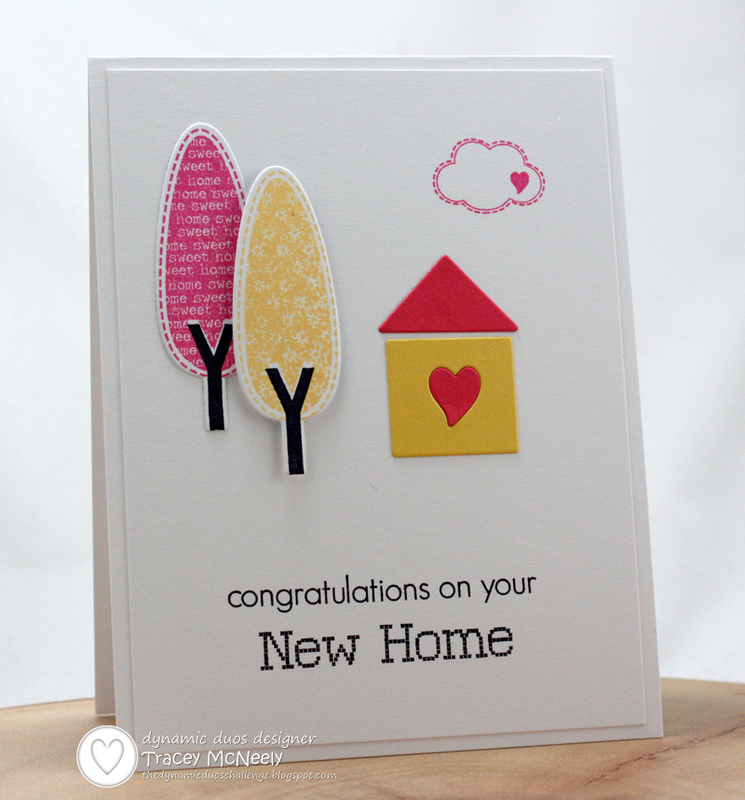 For my card I used my new Home Sweet Home stamps and dies from Clearly Besotted. I love the fresh images and those trees have the best shape. I used a combination of stamping, stamping on die cuts and die cutting cardstock to build a tiny scene. 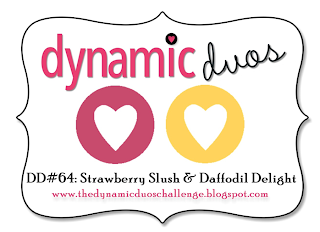 Hope you can come and play with us this week at Dynamic Duos! This is SO cute Tracey. I love how you have used Stephanie's stamps and dies. Very cute scene Tracey, I like the little cloud!! Love those trees! Such a darling scene you've created. Tracey, this is just about as cute as they come. I just love those sweet little trees and your colors are just so adorable. Love these colors Tracey...cute little trees and house, such a sweet scene. This is just so adorable! Love those trees! Oh, Tracey, the colors and design are so sweet! Awesome card! so cute!! love those trees!! Oh my. Another work of clean and simple perfection Tracey. Love it!!! Your gorgeous CAS card really suits those bright colours Tracey. You always have such crisp stamping! I LOVE your trees in these non-traditional-tree-colors, Tracey! This will be a pure delight for any new homeowner!! Adorable and cozy scene! Those trees are so cute, Tracey! Oh, Tracy...this has been SUCH a busy summer and I am so behind on blogging!!! I THINK I just caught up on what I've missed from you! I'll just quickly tell some fave's...the fortune cookie...CUTE!! !...the blue Color Q daisy card...so pretty!...BOTH of your 'Yay' cards were awesome!! !...the ultra-CAS 'wish big' card...beautiful!! !...and finally, your Muse card...Oh, I loved that one...congrats on that invitation...you deserved it!!! Beautiful work, my friend!!! Your little trees are so adorable. Great card with lots of white space! Fabulous card Tracey - LOVE these stamps & dies & you have used them perfectly!